You can use JungleMail for Office 365 to send reminders in SharePoint Online/Office 365. In this tutorial, you will learn how to use JungleMail 365 to send reminders. JungleMail for Office 365 can be used to notify users about overdue tasks and approaching meetings and deadlines. In this tutorial, we will show how you can use JungleMail 365 to create reminders for soon-to-expire contracts. 1. Navigate to the document library in which you store your contracts. 2. Launch JungleMail for Office 365. 3. Select your contract list as the recipient source for your campaign. 4. Now, for the Recipients column, you will need to select the column that contains the people that are responsible for that contract. This could be the person who has created the contract, or this might be different for every contract. In this example, each contract is managed by a different person. 5. You can now move on the template step. 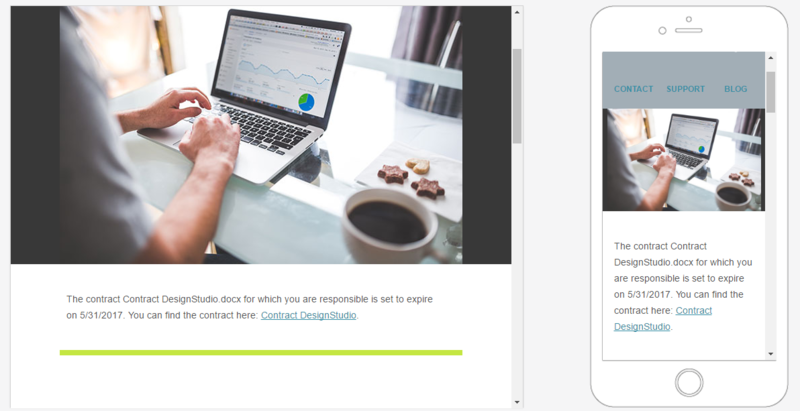 Choose an existing template or create one from scratch. For this example, we are going to use an existing template. 6. Once you have opened your existing or new template select the block that you want to enter the conditions for your reminder in. You will now have to switch the Dynamic Block Switch on for this section. 7. Select the list you want to set the reminder for. In this example , it is the contracts list. Now you will be able to set the conditions for your reminder. 8. You will have to set the time frame for when you want to be reminded. In this example, we have chosen that we want to be notified 15 days before a contract is about to expire. So we put the condition: Expiration date is less than today+15. To make sure we do not get a reminder for contracts that have already expired, we also add the condition: Expiration date is greater than today +1. Finally, you will also have to list the column that names the person responsible for the contract so that they will receive the email. 9. Make sure to check the Do not send e-mail if no result were returned checkbox. This will prevent sending empty emails. 10. You can also add a text to your email that is specific to the contracts and the recipients. 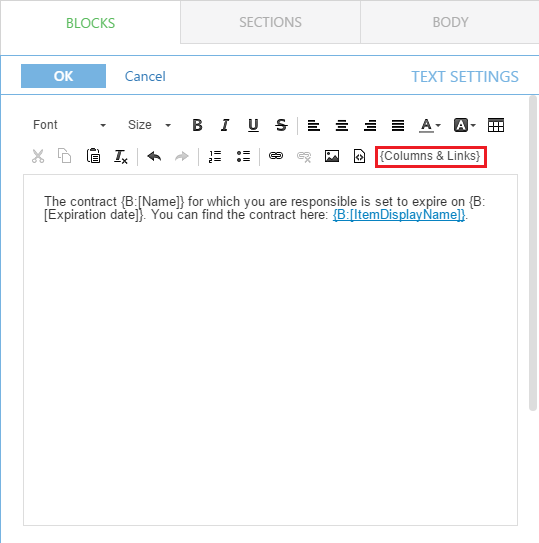 Open the text block, flip the Dynamic Block switch and select the Columns & Links button. 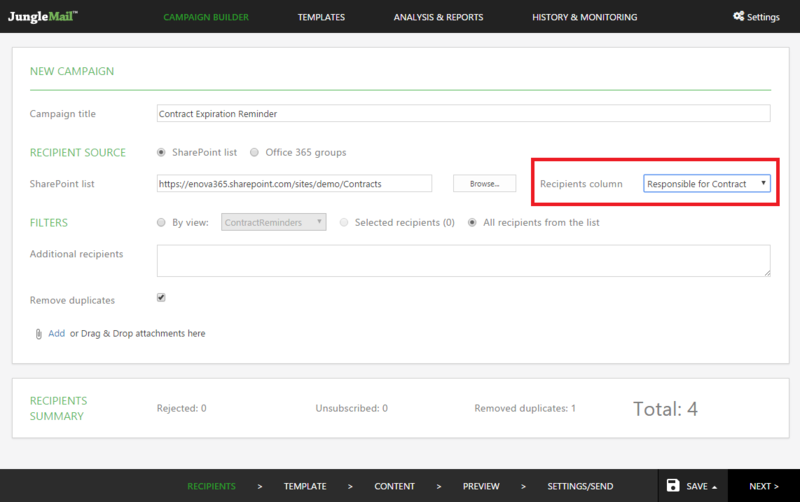 Now insert the columns you need and if you are not sure just check your SharePoint list. 11. Move on to the Preview step and check if your Dynamic Block works. In the image below you can see what our example looks like in the Preview step. 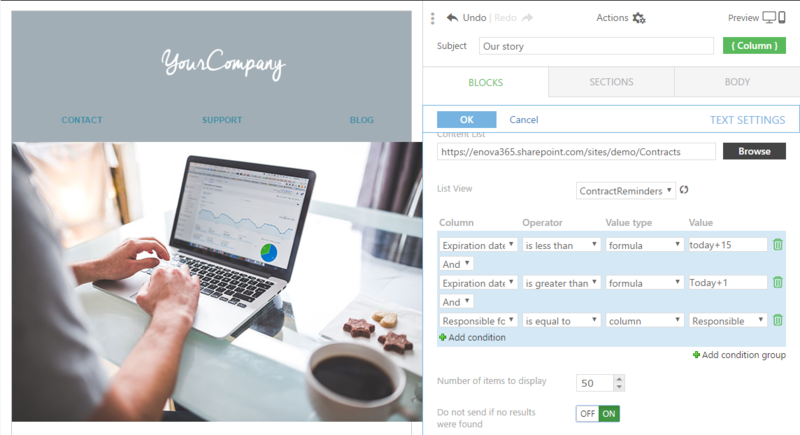 Can I use information from my SharePoint Online to personalize newsletters?